Here is book from Puffin that is a refreshing insight into India with its rich culture, science, maths, natural bounty. A kid (and adult) friendly book full of facts and trivia presented in an unusual manner and organized alphabetically by Vidya and Veena. For instance, M is dedicated to music , monuments, monsoon and monsters, B stands for beaches and bazaars , Bollywood and Buddha and even the Bhopal Gas tragedy. The book is enlivened by witty and fun comic strip style observations by Greystroke. ST- After very factual, serious books on India, this was a refreshing take on facts- how did the idea come about? Vidya- The idea was Puffin's. The Puffin editor Sohini Mitra said they wanted a buzzy and bright fact book on India that was done alphabetically. What we agreed upon mutually was that we would not stick to doing mere facts. Since we had a page or two to every topic we were writing on, facts have been fleshed out into stories, trivia tidbits and incredible info segments, all of which offer the reader a good perspective of the topic being written about. The idea to lighten up the book and give readers lots of 'haa haa's' was ours and that was because we have a wonderful cartoonist inhouse. Also, we've always believed that there's nothing like a good laugh to make gyan more appealing and accessible! Would you like to nominate a companion book to this one ? I think Puffin's 'Let's Go Time Travelling through India' and Tulika's 'Little Indians' would come closer primarily because ours is not a mere fact book. The comics, the titles- how did they evolve? Completely out of our heads! Right from the start we decided that everything about the book would be quirky and catchy because that helps get young readers interested. So the headers to most trivia segments are alliterative, the book's subtitle (An Alphabetical Tour of Incredible India) is jolly and inviting and the writing is peppered with humour. The cartoons are of course the magical part of the book! They were all mostly Greystroke's ideas, but, in some instances, if a good line came up when Veena and I were writing, we'd put it in as a cartoon suggestion. 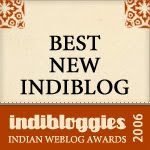 There is a mix of India and generic alphabet related stuff - how did you prune and arrive at which ones to take forward? That was the hardest part and took quite a while. Veena and I made a L-O-N-G master list of generic topics that needed to be covered in the book. For instance, places, festivals, markets, environment, science, crafts, personalities and suchlike. Plus, we also wanted something in from every state and union territory of India. So what we tried to ensure in the final alphabet list was that every generic topic and every region got covered in some way. Basically we wanted the book to have something in it for everyone. Puffin's editors worked closely with us to ensure we got an interesting mix in place. Did you travel more to see any of these places, did you meet /speak to interesting people while adding info? Wish children's book budgets would make that possible! We certainly did a lot of armchair travelling and zooming up and down the information highway! However, facts have a marvellous way of popping up out of somewhere, anywhere unexpectedly. In fact, wherever I travelled personally during that period, I could only see facts in front of my eyes! I mean it, I would read inscriptions at monuments and museums, craft catalogues, highway signs at toll plazas, tourist brochures and even application forms with such attention that my family started to joke that it was better we added an extra day or two to every holiday plan! For someone who rarely takes photos on a mobile phone, mine soon ran out of space because it was filled with photographs of plaques, inscriptions, signages and book extracts which I thought would be helpful in the writing. So yes, our personal travels did contribute many interesting facts to the book. Since all of us have been putting together children's magazines for many years now, we also had access to people we had interviewed across the years - environmentalists, scientists, historians, travel writers - and it was possible to call them to verify whether some information was right or wrong. How were facts verified- what kind of research went into the book? Painstakingly! We scoured books, newspapers, magazines, encyclopedias, diaries, government bulletins, reliable/official websites and travel/photo blogs for information. Every fact was checked and rechecked from many sources. You are aware that it is very hard to get definite statistics and facts on India, so wherever we could not get them verified from at least two reliable sources, we took care not to put it into the book. Right through the time we were working on the book, we'd keep track of which segment each one of us was working on. And since we were so steeped in what we were researching or writing or illustrating, after a while, it became common for to say, "I am in Varanasi today. Where are you?" And this, while we were sitting in adjacent rooms in our office in Bangalore! What do you think is the relevance of the book in the era of wikipedia and google baba? Generally speaking, the information on Wikipedia or any other website is only a starting point. It is not something you can or should rely on with certainty. Besides, the information is not really written for children. 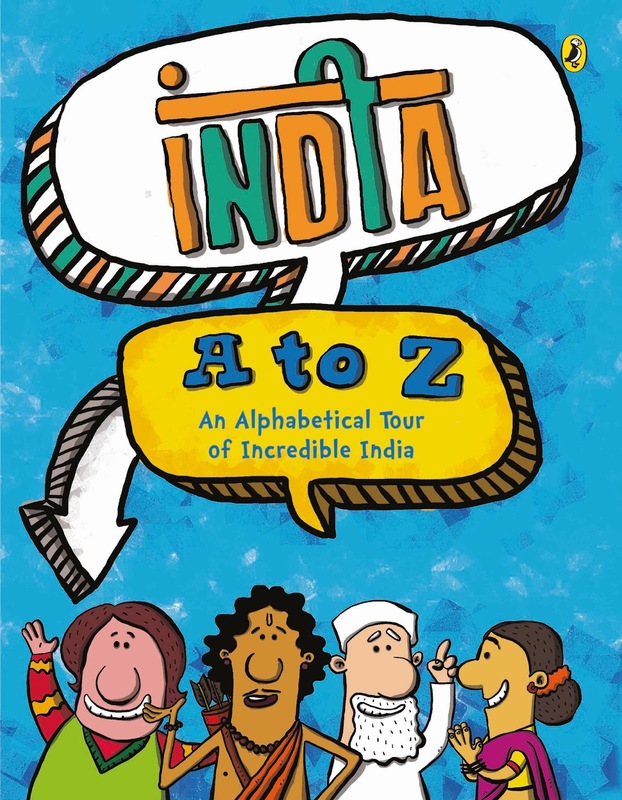 India: A to Z is... written for children, I mean. It can be used for project ideas, to boost general knowledge, as a ready reference and even simply for the pleasure of reading and discovery. So, if all you're looking for is a bland fact, Wiki or Google or any website will give it to you. 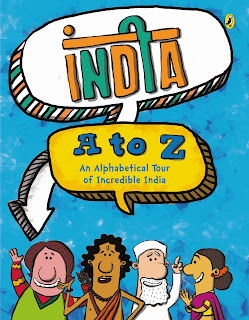 But if you're looking for an alphabetical tour of Incredible India, India: A to Z is your book! And going by the 8 year old at home, it is likely to be a sure hit with kids! Here's another review of the same book by the Mad Momma. 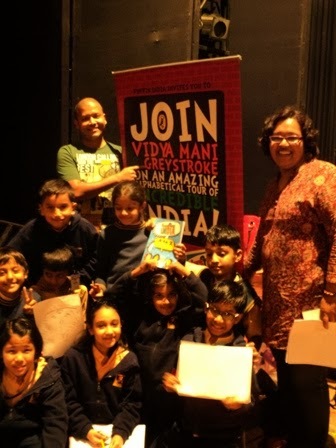 Thanks, Vidya, for the inside story, and thanks Art for bringing it to us! India: A to Z sounds like a wonderful book. WANT! Adding to list of books to be bought on des trip! Sheela- yes, some eye openers for adults too. I was wondering why you had not yet commented Chox! Thanks, Sheela and Choxbox, for the compliments! When you're done with your alphabetical tour of Incredible India, would love to get your feedback on the book.